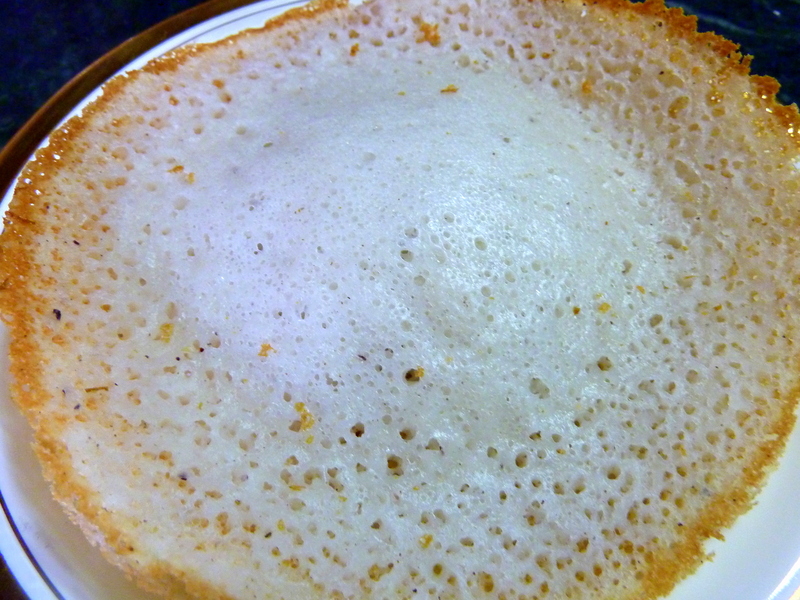 Appam is a traditional dish of Kerala. It is generally known as vellaiappam. It is prepared with a batter of rice and scraped coconut. Appam or Aapam as its is known in some other parts of Kerala can also be made by adding toddy/ kall and is called kallappam. Kall is used for fermentation and gives the appam a unique taste. Soak the rice along with the cooked rice in water for 8 hours. After soaking it for 8 hours grind the rice and coconut together in small portions to a smooth paste and add little bit of water to the batter to have a smooth consistency. In a small cup take the warm water and add the yeast and 1 tsp sugar, cover and keep aside for 10 minutes. Add this yeast along with the water to the batter. Now Cover this batter and allow it to ferment for another 6-8 hours. When the batter becomes fluffy with fermentation then add salt and mix well. Then add the remaining sugar to this and again mix well. Now heat a kadhai or appam chatti and grease it well with oil. Then on low flame add 1½ big serving spoonful of the batter to the kadhai and spread the batter a little with circular motion so some batter stays in the center. Now cover with a lid and let the appam cook. When the sides become slightly brown and center rises up take the appam out and serve hot. Appam is served best with spicy chicken curry or chicken stew or chickpeas (kadala) curry or egg curry or potato stew.